The project strictly ignores the rules of the established art markets. It´s all about “the joy of insight” as OUBEY once said: sharing, exploring and discovering the secrets of his paintings through immediate personal encounters. We are keen on non-predictable, unexpected and surprising thoughts and associations about OUBEYs work by scientists, researchers, futurists, philosophers, sportsmen and children. 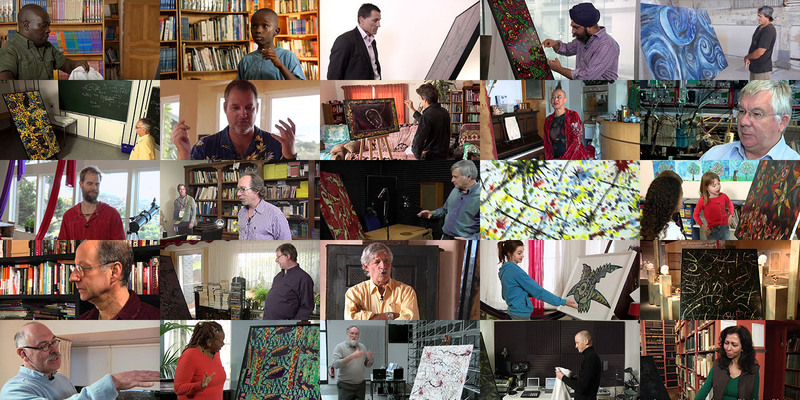 We encourage these non-art-experts to share their response with us while a camera is running. And OUBEYs paintings enable them to let loose and enjoy the experience of discovery. Once they agree, their video gets published and may encourage and enable others to find their very own and personal access to OUBEYs art and hopefully to art in general. This approach of OUBEY MINDKISS is definitely unique and pioneer. To get an impression, just have a look at the pics below. Are you curious to see the videos? Just visit the Encounters with OUBEY and make your choice. „Es gibt das Mikroskop, es gibt das Teleskop und nun gibt es auch das Oubeyskop“, schrieb mir vor kurzem jemand, der sich wohl ein wenig tiefer in OUBEYs Werk hineinbewegt und hineingedacht hat und dabei zu einer Erkenntnis kam, die zu dieser Wortschöpfung führte. “Was wir heute brauchen, sind keine visionären Vordenker, sondern neugierige Grenzgänger, denn Grenzgänger halten Komplexität aus”, lautete eine der zentralen Aussagen von Prof. Peter Kruse in seinem Vortrag zur Ausstellungseröffnung der OUBEY Global Encounter Tour in Berlin am 21. März 2013.